This Regina Schrambling recipe, adapted from The Wednesday Chef, makes a delicious cool-weather, make-ahead appetizer. I especially like it spread on thin slices of dense, hearty bread, like the spelt bread made at little t american baker in Portland. Serve with small glasses of chilled Aquavit, cocktails, white wine, or something bubbly. In a saucepan, combine the wine, bay leaf, salt, and peppercorns; bring to a simmer. Add the fresh salmon, skin side down, and poach very gently, turning after several minutes, until just cooked through; the time will vary depending on how thin or thick the piece of salmon is. Remove the salmon from the pan to a plate. When cool enough to handle, strip the skin from the salmon, remove the bones, and break the flesh into small pieces. Place the cooked salmon in a medium bowl and break it into smaller pieces with a fork. 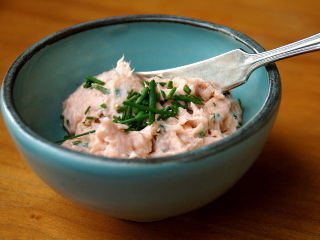 Add the smoked salmon, crème fraîche, 2 tablespoons of the chives, and the lemon juice; mix well. Taste, adding more crème fraîche and lemon juice to taste, then add a pinch of cayenne pepper, as well as salt and pepper to taste. Cover and chill at least an hour to allow the flavors to meld. Return to room temperature before serving. To serve, sprinkle with the remaining chives and set out slices of bread (or crackers). Let guests serve themselves, spreading the rillettes over the bread or crackers.